It's entirely too hot here to even think about eating ramen. Excessive heat advisories are in effect; the sun is shining; it's finally summer. And ramen. Well ramen isn't a summery dish just by the virtue of its design. But that's what happens when the weather catches up with a food blog backlog. Not too many weeks ago, it was cool enough to enjoy a hot, steaming bowl of the good stuff; the Japanese antidote to the June gloom. 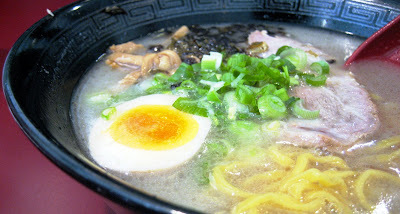 And during two particularly chilly, cloud-covered days, I decided to explore Baker street in Costa Mesa, where there exists not one, but two ramen joints, separated from each other by mere blocks and competing for the same noodle dollar with heavyweight Santoka and Oki Doki (which are also in the neighborhood). The first of which was a joint called Kohryu. Found on the corner of Baker and Bear, it occupies a seemingly cramped corner of a quiet strip mall. But once I stepped inside, I was surprised to see that the space opened up to a wider footprint, with more seats than the unassumingly tiny entrance led me to believe was possible. I saddled up to the bar and ordered a Koi Ramen, which turned out to be just what I needed. The soup was murky white, like diluted milk, and harbored a savory pork flavor similar to the Hakata style of broth (where pork bones are vigorously boiled to give up their essence). But it was unlike it in two ways. First, it wasn't as sweet, exhibiting a slight bitterness which I found pleasant. Second, it was lighter on the tongue and not as fatty-rich, almost to the point of being watered down. The noodles were also different. And on this end, I wasn't overly impressed. What was used were egg noodles; bright canary yellow ones, which were thick like linguini. And paradoxically, the strands got harder the longer it stayed in the soup. The toppings were from the list of usual suspects. There was a pleasantly unctuous, fatty piece of pork; a half of a boiled egg, with a yolk that was just shy of set; and some crunchy strips of bamboo shoots. What wasn't expected was the two variations of green onion. Some were freshly cut and others were purposely burnt black to embers. I liked the contrast, but figured out that it was probably these charred bits which contributed to the slight bitterness of the broth. Down the street, hidden behind the Wahoo's on Baker and Bristol, is Mentatsu. This location has been home to many a ramen house. But its current incarnation is by far the cleanest and most hospitable of the lot. In other words, Mentatsu is spotless and bright, where before, under another name I can't remember, it was grimy and dark. What I decided to try was the plain ol' Shio Ramen; a standby when you can't think of anything else to order. And the broth was clear, with a dark brown tint and a soy-sauce tang. Bubbles of sweet pork fat skittered across the top -- an indication that this elixir was full of flavor. The noodle was nicely chewy, becoming more supple as I continued slurping, but the pork was lean; too lean. But bamboo shoots, green onion, the hard boiled egg were all present an accounted for, along with some of those pink-rimmed fish cakes. These exist merely for color, but one can't complain about its resilient texture, which playfully bounced between my teeth. 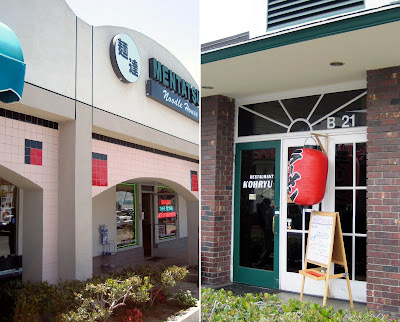 Both ramen houses have their unique qualities, but I will wait until the mercury drops before I revisit either one. But who's to say I can't have it, say, for a late summer supper when the sun has gone down. Just read the OC Register article. Congrats on that, it's a lot of hardwork, but we appreciated. Great job on the writeup of these two ramen places. this post was launched more than 12 hours ago, and Professor Salt hasn't responded yet!! Only you can make anyone crave a bowl of ramen when it's so freaking hot outside!! Elmo, which of these two places did you like most? Thanks! It *IS* a lot of work. But it's still fun to me, so I'll keep on truckin'! That broth was nice and oily. I would've drunk the whole thing down except that it would've gotten me too full. I think it must! I hope to get inspiration from your subconcious for next week's post. Because I've got no clue what I'm going to blog about next. HAHA! Well this post would be old hat to the Prof. He's done a ramen crawl through the neighborhood and wrote up an excellent post (and OC Weekly article) on it. I think I'd say I liked both equally. 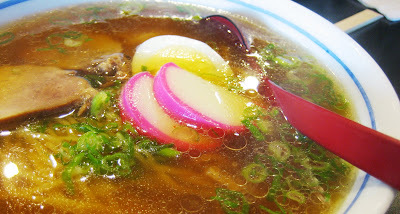 A good bowl would have Kohryu's broth and pork, with Mentatsu's noodles. Of course, Santoka remains my favorite ramen. Even if it costs a little more and the parking is horrendous. Ah, will have to tuck this review away for cooler days - but thanks, Elmo! They are near my office, will have to check them out during lunch. I love a bowl of good ol' shio ramen. LUckily, we have a wonderful, small ramen house just across the street from us. Oddly enough, thoug, the best ramen I[ve ever tasted is in thhe food court at Mitsuwa Marketplace. The one in Arlington Heights, IL, that is. Personally, I'm somewhat torn by the news. On the one hand, it's great that a dinky little place from Tustin (and FV) could find its way to the 'other' county. On the other hand, it's no longer only in OC, which decreases the OC locations' value and uniqueness just a bit. Have you tried Santoka? If you haven't you've got to. Not sure if it'll be better than Tokyo, but it sure hits the spot (and saves on the plane ticket)! I think I already know Daikokuya's going to blow these two out of the water. Now if only this high pressure system would just leave already! Come on cool air! An untimely post, but definitely one that couldn't wait until it gets cooler. Mentatsu is liable to change hands by winter...it's been through different incarnations over the past five years. Curiously enough, they were all ramen shops. I like 'em both, but I love Santoka. I hear the fried rice at Kohryu is really, really good though. Made with butter. Is the one in Mitsuwa called Santoka? If so, I'm not surprised. They're the best! Oh I agree wholeheartedly. In some respects its good that Honda Ya is expanding...but I feel kind of protective of it as being a unique OC thing...I'll have to check it out (yep, via Metrolink). But really nothing can replicate the ambience of Honda Ya's current location. It's so organically part of that structure that it's hard to imagine how they can replicate it in a new setting in L.A. Anyway, it's going to give Haru Ulala (which is I think in the same area) a run for its money. Mentatsu is........HORRIBLE. I have never tasted such bad ramen in my life. Such bad gyoza. Such bad katsu curry. oh my! It's absolutely horrifying that the chef doesn't realize how bad his food tastes. I brought a group of friends and felt so bad I treated all of them. You too huh? The first time I went to Gaja, it was also during a heat wave. What a bad error in judgment on my part. My friends were all impressed with the food, but not the heat. You may be right since I tasted exactly one bowl of ramen from each place. One is not a representative sampling. Actually, I think even if I tried three bowls from each, I doubt it will match my all time fave, Santoka! Yeah, I think that was the name of the ramen place at Mitsuwa. I miss that place. Mmmm...if only I have the talent to turn those top-notch ingredients into ramen. You and Bee have the monopoly of blog cooking prowess. Oh I'd miss Santoka too if I left the neighborhood. That's some seriously fine ramen. I like 'em nice and supple. Not so soft that I don't have to chew, but just enough so that I can revel in the ease of the dough. I agree wit hzelik, Mentatsu is horrible. It's so horrible I feel it's my duty to post this. The miso ramen soup is sub-par with a grainy texture and poor miso flavor. The noodles are the bad hard with a poor texture, and do nothing to complement the flavor of the soup. yeah, Mentatsu Ramen is indeed awful. Both the Salt and Miso base were tasteless. The pork had to be the toughest dryest piece of meat I've ever had. I'm not even exaggerating here.